The maple syrup adds a complex sweetness to this dish that plays nicely with the acid from the lime and the salty soy sauce. Cut Tuna Steak into 1 inch cubes. In a large bowl mix Maple Syrup, Soy Sauce, Rice Vinegar, and Chili Flakes. Squeeze in Lime and discard rind. Whisk all ingredients together and add chunked Tuna. Cover and place in refrigerator for at least 30 mins. 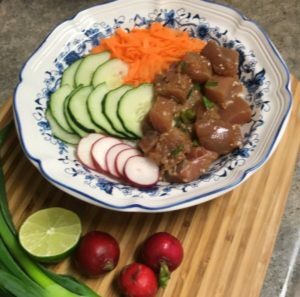 While Tuna marinates, shred carrot, slice Radishes, and Slice cucumber. Once Tuna has marinated, place all ingredients over hot rice in a dish or bowl and enjoy.